30 minutes later we heard Finn screaming that Woody was broken. 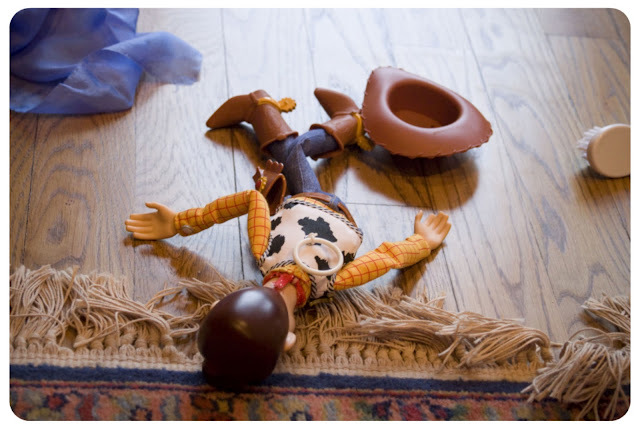 Sure enough, Woody's head had been severed from his body. When asked, Maya said, "TRY to prove I'm guilty. I dare you!" Needless to say, there was plenty of drama (on everyone's part) concerning the headless Woody. Amazon got right on it. Come Monday morning, Santa had sent Finn a new Woody doll, and Granddad had sent Dada to Walmart to get one for Maya—STAT! Our house now has two pull-string Woody dolls. awe haha this made me smile. poor woody!! 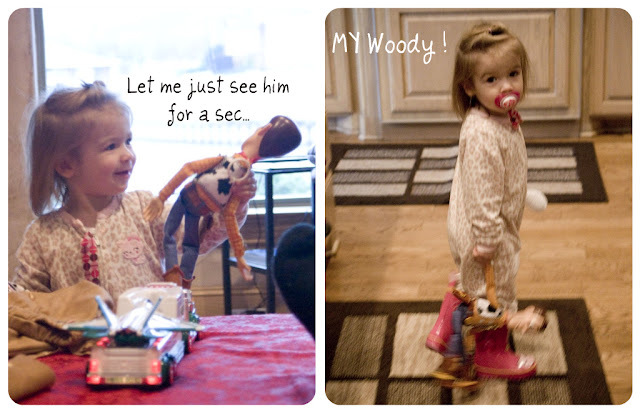 and that picture MY WOODY is soo stinkin cute! My kids are 18 months apart and I could so relate. Granddads are great! I would never go out and buy another Woody.. but if granddad did who am I to argue?? Love it. Your kids are precious! Cute! I can TOTALLY see it. Who wouldn't want big brother's awesome pull-string cowboy? Ohhhhh this makes me laugh so hard. Welcome to the world of siblings. Sad to tell you that it's only the beginning. My kids STILL do this!!! HA! Allow me to tell you how adorable she is for the umpteenth time! yep, sounds about right. I buy duplicates of everything. Luke's birthday is coing up and he said that he wants a Hiro train (from Thomas) he also announced that he would like a hHiro train for Gavin so that they could play "hiro's" together. I think Luke has also caught on that having 2 of something means that he doesn't have to "take turns".